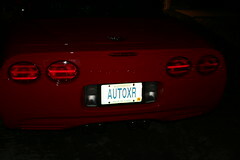 Welcome to the home of the CorvetteZ06.org Autocross Team. From here you will be able to find out more about the drivers, the car, and the events we participate in throughout the year. Be sure to check out some of our videos, blog posts and latest photos. If you are interested in becoming a sponsor we have multiple levels of sponsorship to assist your company with reaching a targeted and very active market. So I finally got someone else to drive the car and confirm that the issue isn't in my head :( Dave drove it and his first comment was "wow" I'm going to jack the car up and see if I can't find something loose in the rear subframe, I hope I find something! Found it! Car running again! I went ahead and cut/spliced everything back together, so far the car seems to be fine. I'll order a replacement wire from the dealer Monday morning. I'm also going to try to get another alignment in the morning, I'm not convinced the alignment from Thursday was correct, we'll see how that goes. So this was supposed to be a quiet weekend, the first weekend off of racing since the 14th of June. While it is true that we won't be racing this weekend, it doesn't mean we won't be working. There's something wrong with the Corvette, something pretty massive, though thus far untraceable. Something is going on with the suspension, or drivetrain, causing it to feel very unsafe under acceleration, but fine when cruising down the road. This evening it started throwing errors about "Service ABS" "Service Traction Control" and "Service Active Handling" which I have seen before, but a quick reset of the car has always made these go away. Well not tonight, so, this weekend I'll be thoroughly going through the suspension of the car to try and track down WTF is going on. Hopefully I find something, otherwise I'll be taking it to the dealer first thing Monday morning. I hate to have to resort to that, but I need the car repaired ASAP as we leave on Thursday to head to Topeka for 10 days of racing! Here's the autocross video of Natalie's third run on Saturday at the Kansas City National Tour. The cone lodged under the car is from the codriver, it ended up causing a 2 second penalty and determining the class order for the weekend! Read more about that on the blog post from last night. For the video read the full post. A heads up to anyone who codrives with the Whitworths anytime in the future... They hit so many cones, that these cones start to haunt the other drivers in the car! A funny thing happened on Natalie's last run on Saturday. I was filming the run and saw something pecular. After a short time on the course I noticed a cone under the back of the Corvette, I was pretty sure that Natalie didn't hit a cone at the beginning of this run so it had to have come from Beth's previous run in which she blasted into a cone right before the finish. I hadn't bothered to look under the car when Beth got back from her run and we were prepping the car for Natalie, had I looked I am pretty sure I would have found a cone somewhere near the rear diff. Off we are headed to Kansas City for the National Tour. This will be Natalie's first National event, heck her first out of town event! More updates tomorrow. 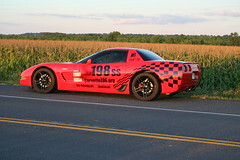 Today we ran the last local event of 2008 for the CorvetteZ06.org team here in St. Louis. It was another successful day today, the car taking FTD, Top Pax, 3rd on Pax and top on the Ladies Pax as well! This is the fourth time this year (out of 6) that I was able to finish on top of Pax. I'm pleased with this result, though I won't win overall Pax for the year, had the points been normal this year (6 events counting, with all events being equal) I believe I would have had a shot. Natalie did very well today, taking a win in SSL as well as the overall ladies win. This was just her fourth autocross ever, and only her 3rd in the Corvette so I am very happy with her performance! I'm starting to get sad that the car will be going away, but I am glad it is going to a good home, someone who will autocross her just as much if not more than I have. We've still got a month or so together, so I will enjoy her while she's here! I spent the day today cleaning up the Corvette and then setup the new look of the car for the upcoming Solo Nationals. 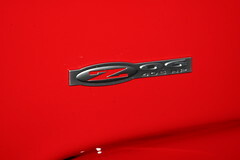 A big thanks to Dave at www.SoloPerformance.com for getting the vinyl cut yesterday. It took me pretty much all afternoon to get this done, with washing the car, clay barring a few parts of the car, polish and wax, applying the vinyl then another wash. Check out the video on the full blog post. I'll have video posted later but for today check out this new photo! 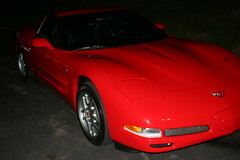 2004 Corvette Z06 For Sale! After the Solo Nationals this year the Corvette (available mid to late September) will be for sale as I have other plans for the next year. This car has been exciting, and if I didn't have some big things coming up in the next 12 months I would be keeping it and running it all next year. I wouldn't be opposed to someone buying the car and me co-driving it next year at National events, and some local STL events. Any co-drive arrangements would be made seperate of the sale of the vehicle. 3 Sets of C5 Z06 wheels, not sure what tires will be left/included with sale. The car has been well maintained and cared for, all fluids changed recently, transmission and diff using Red Line, Mobil 1 Synthetic used exclusively in the motor. I’m looking for $31k for the car and all the above parts. Welcome to CorvetteZ06.org, check out more photos here.